The woman walks up to the phone and picks up the receiver. For those who generally have lives, I would like to bring to your attention that the television show 24 recently concluded on Colors TV. I have always maintained that it is impossible to watch Indian television for more than on hour. But since each episode of 24 is 45 minutes, I watched it. Based on the American franchise of the same name, each season of the show has 24 episodes, depicting 24 hours in the life of a cop. Anil Kapoor, who acted in one of the seasons of the American version, brought the show to India. I began watching the show, and interestingly, during the promotion, Anil Kapoor spoke about how the technicians on the show are from America and its all being done professionally and it will be something that hasn’t been seen on Indian televisions yet. I was curious to see how the story would be adapted to an Indian context. And boy, did they adapt! Let me begin with a brief introduction of the characters in the show. 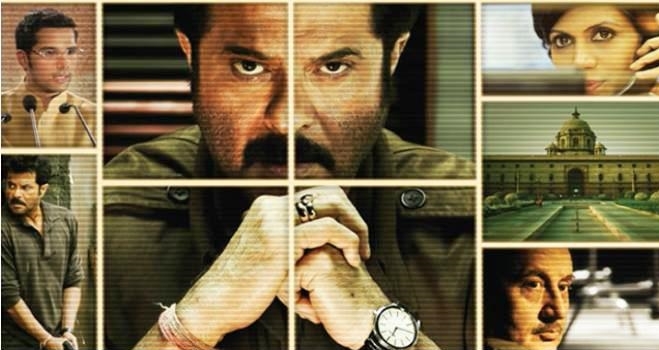 The show is about Anil Kapoor who plays an officer in the Anti Terrorist Unit, who has to protect the life of a young politician who’s to take oath the next day as the Prime Minister of the nation. Aditya Singhania: A Prime Minister in waiting. This person belongs to a family that has been involved in politics for years, and looks like a 40 year old, moderately good looking person. He’s always dressed in khadi jackets and has a somber expression on his face, which could be due to the fact that his father was assassinated in a conspiracy. Naina Singhania: Is Aditya’s mother. She controls the party and is a sharp, shrewd woman. Divya Singhania: Is Aditya’s sister, who is married to a businessman. She is a wise person, and is often the voice of reason for Aditya. Prithvi Singhania: Is Aditya’s cousin. He is a loudmouth, someone who schemes against Aditya. Rahul Singh: Aditya’s brother in law, doesn’t do much on the show. Appears once in a while, but is generally shown as a useless guy with some shady deals. Ravinder: Is an outlaw militant leader, who is dark, has a thick moustache, and speaks with a Tamil accent. He leads an outfit called LTFE, and they’re trying to assassinate the Prime Minister in waiting. Well played, guys. Very subtle. Take a bow-wow. But then, if they were going the whole hog, why couldn’t they go all the way? Why take half measures? You know what would have hooked me on to the show? If they had someone play Sanjay Gandhi. ‘Cos if they did, the show would have to be rechristened 48. For Sanjay Gandhi was the most colourful personality in the most celebrated family of the most densely populated nation in the world. While most in our generation wouldn’t know much about Sanjay Gandhi, reading up on him is a fascinating exercise. It’s a life that’s straight out of a Darren Arofonsky movie. The eldest son of Indira Gandhi, Sanjay was very comfortable in his skin as the scion of the family. Having an interest in automobiles, fast cars, and airplanes from childhood, Sanjay Gandhi was given a three year internship with Rolls Royce, without even a college degree. He decided to skip in the second year and returned to India. In 1971, Sanjay Gandhi was allowed to found Maruti Udyog, the company which partnered with Suzuki to produce a ‘People’s Car’. The once ubiquitous Maruti 800 was born from the project, but while Sanjay was alive, not a single car was produced. The one singular car that was exhibited stopped running after a distance. With the declaration of the Emergency, Sanjay Gandhi was touted to be the most powerful person in the nation. Without so much as an official position of power in the country, he transferred officers, set up offices, dismissed people – as and when it pleased him. After a trip to Europe, he found the slums of Delhi too dirty for his taste, and had over 70,000 people evacuated to the other side of the Yamuna. In the protests, over 150 people died. When Kishore Kumar refused to perform at an event, his songs were banned from the All India Radio. With desires like wanting to open casinos in the Himalayas, Sanjay Gandhi started a number of programmes and initiatives. Like the one thing that people associate with him even today – the Compulsory Sterelization programme. Since the population of the country was increasing at an astonishing rate, people were offered gifts to voluntarily sterilize themselves. When that didn’t work out, the programme turned into a bizarre scenario where government doctors were given targets to sterilize people. Thousands were sterilized, many of them involuntarily. Sanjay Gandhi’s death was as eventful as his life. He was flying an aircraft, trying to perform a loop over his office. The plane crashed and an Air Force captain died with him. Now, my dear writer brothers and sisters, if you are portraying the entire family anyway, why not go the whole hog? It’d be so cool to have a total badass on the show. A guy who does whatever he wants to do. And they should have cast Asrani to essay the role. Or Sanjay Kapoor. The character should have gone batshit crazy on the show. Like getting Shweta Tiwari to do an item number in the middle of show. Just because. Or show him shooting some cops, paragliding from the Parliament, and then becoming Monkey Man in the night to terrorise innocent residents. Now that, would have gotten my attention. Sadly, creative thoughts are seldom appreciated in our world. So the show went about its motions. Anil Kapoor ran around and looked serious. And in the 24 most important hours in the life of the top ATU officer, his wife confronts his colleague about their past relationship. You know, kyunki wife bhi kabhi girlfriend thi. The man looks a little fat, but his good looks can melt wood and metal alike. He walks to the phone and answers it. This entry was posted in Television and tagged 24, Anil Kapoor, Gandhi family, Sanjay Gandhi on January 8, 2014 by .